Products can often be though of as bundles of consumer benefits. The core benefit is really what the consumer is buying. Products can be end results. They can be services or physical objects. According to Michael Solomon, they can even be people, places, and ideas. Products are an interesting part of the marketing mix (product, price, promotion, and sometimes placement) because products are the most difficult to change after they have been planned and manufactured. Products have elements of convenience, shopping, specialty, low & high involvement, function, and emotion. It is important to market these factors correctly because by default, not everyone will place a product in the same categories. Brand, delivery, installation, customer service, warranties, and payment methods are some examples of how a product can be augmented. As a product becomes more mainstream, augmentation will become more important as a differentiator. A product mix is made up of all product lines. A product line is a number of products that have a similar function, style, manufacturing process, distribution process, consumption method, or market segment. These exist so a firm can satisfy multiple market segments at once. Breadth: Number of product lines. Depth, Length: Number of products within a line. Horizontal dimension: Differentiation by consumer taste. Vertical dimension: Differentiation by performance and price. Continuous innovation: An improvement to how something is currently done. Discontinuous innovation: A new way of doing something. New product development should always be taking place. Although many innovations become apparent after consumers are exposed to them, innovations and products alone cannot create demand. Consumers must want or need a product once it exists. First you generate ideas. After amassing a number of ideas, those ideas are screened. The ideas that remain are fleshed out into concepts. When you have screened concepts, it is a good time to start getting market feedback. With that feedback in mind, a marketing strategy is defined and a business case is built for a rough idea of whether or not the concept is profitable. Product development then begins. Depending on the cost of product development, an amount of test marketing takes place during the product development. Finally, commercialization occurs and the product is released. Go/No-Go decisions must not be based on passing simple hurdles, some metrics may be needed. Also, the product must fit the company and it's mission. Consumers will compare products to competing products. If no competition for a product exists, consumers will compare the new product to the current way of doing things without the new product. 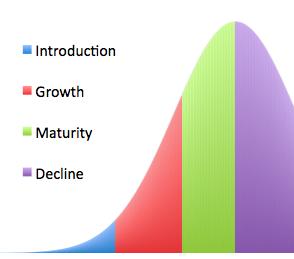 In theory, product life-cycles generally follow a development, introduction, growth, maturity, and decline stage. At the end of the day, some products may have little demand. Even those products with little demand should be maintained as long as they bring in enough to cover their costs. This is done to placate consumers who have already purchased older products and may feel like they have been abandoned or that what they have is obsolete if the product is discontinued. Then again, maybe that's the marketing spin you want.